Deirdre Jacob was last seen at the gate of her family home after walking back from Newbridge town, Kildare where she went to get a bank draft. 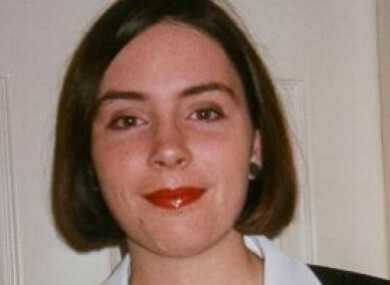 THE FATHER OF missing woman Deirdre Jacob has criticised what he described as a ‘hit and miss’ practice in the investigation of missing person cases in Ireland. At the close of a ceremony in Farmleigh House in Dublin today to mark the fifth National Missing Persons Day, Michael Jacob asked if he could address the crowd. “This event gives the families of missing a good feeling for a couple of hours, but it’s only today and then we wait for another year to come around,” he said, after he was invited to speak from the podium. His daughter, just 18-years-old at the time, went missing on 28 July 1998. She was last seen at the gate of her family home after walking back from Newbridge town, Kildare where she went to get a bank draft. Despite numerous public appeals over the years, no trace of Deirdre has ever been found. “To Minister for Justice Charlie Flanagan, you are looking at a very small group of people that have had a life changing and life shattering happening visited on them by a family member going missing. There is only so much that we can do. We need help,” he said. There are many cases of people missing for five, ten, twenty, thirty, forty and as we heard here today, 70 years, with little or no progress being made – all because of a hit and miss practice of investigation due, in the main, to lack of resources. When times pass in a missing case, that is probably left to the determination of a single guard – that is if he or she is left in that area. “And this is not good enough – what do you think?” he asked. His question was met with a loud round of applause from the audience, which was made up of other family members of missing persons. “Would you, Minister Flanagan, and you Deputy John Twomey, please consider the suffering that the families of the missing endure day after day, waiting and waiting?” he said. Earlier, the minister had told families the establishment of this National Missing Persons Day, and its continued success five years on, demonstrated that society in Ireland acknowledges their suffering and “sincerely cares” about them. Deputy Commissioner John Twomey also addressed the ceremony, describing the pain felt by families of the missing as “shapeless” and “terrifying”. He said the hope that comes with possible developments in a case can be “a torture”, particularly when nothing comes of new information. Although he said investigations take more time than gardaí would like sometimes, he told families this time can be necessary to ensure the job is done properly. Email “'It's not good enough': Deirdre Jacob's father slams lack of progress in missing person cases ”. Feedback on “'It's not good enough': Deirdre Jacob's father slams lack of progress in missing person cases ”.